The Beck Group has a great deck at their Pensacola office. 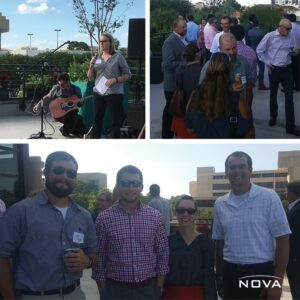 It proved perfect for the Beck Deck Happy Hour event last week. The weather and music were great, and the beverages were cold! This happy hour was a great opportunity to catch up with many different AEC industry players, as well as local Entrepreneurs, Brokers, Attorneys and Sales Associates for Commercial Businesses. NOVA gladly sponsored this gathering.